The phone interview was scheduled for 7:30 am on a Friday, and my phone rings on the dot. “Good morning,” says the voice on the other end, in a distinctly Little Village Chicagoan accent, “this is Chuy García.” Later he comments on how early in the day our conversation is taking place. “Ya estoy bebiendo mi café,” I say, “so I’m good.” He laughs politely and tells me he’s already drank a cup. Jesús García — who goes by “Chuy,” and who has a good chance of becoming the next mayor of Chicago — is apparently also a morning person. His early-rising must be one key to what makes the 58-year-old a living legend in Chicago politics. He’s the city’s civic version of Forrest Gump: the man’s done it all, seen it all, and met them all. Since working as campaign manager for another Chicago icon, Rudy Lozano, García has been elected committeeman and alderman (in the 22nd ward), state senator (in the 1st district), and Cook County commissioner (in the 7th district); he’s been a strong ally of one administration and done battle with two others; he’s partly to blame for the election of Chicago’s first black mayor, Harold Washington, and for the fairer treatment of poor citizens and immigrants alike across the Chicago area; he’s been appointed deputy commissioner in the city’s water department, as well as held the position of either president, executive director or chairman in a handful of community organizations; and his record of public service is known intimately by activists, businesspeople, alderpersons, state legislators and governors, members of Congress, and even the sitting president of the United States himself, with whom García has crossed paths innumerable times over the past two decades. Now García’s hoping he can serve the city in another capacity: as mayor. So what makes this mayoral election different than any other? It seems García may have been awaiting the decisions of two women: Cook County Board President Toni Preckwinkle and Chicago Teachers Union President Karen Lewis. Preckwinkle, whom García serves as floor leader on the county board, announced her decision not to run back in July, saying she had unfinished business as county board president. From that moment on all eyes were on Lewis, who’s been riding a wave of populist support after her public skirmishes with Mayor Rahm over teachers’ rights and last year’s 50 school closings. (Lewis has dubbed Rahm the “murder mayor” for his handling of the city’s soaring murder rate, flagging public housing, crumbling education system, and top-heavy economy; not to be outdone, the mayor once cursed her out during a heated argument in his office.) But when it became known that a brain tumor would keep Lewis from running, it left an opening on the ballot for an independent, progressive candidate with street cred. Someone who has spent their career throwing stones at the political establishment; someone with a proven record of standing with Chicago’s working class and people of every background; someone who doesn’t want to be mayor just so he can someday run for president. Someone like Chuy García. I listen quietly as he delivers his spiel about his decades of experience, about the relationships he’s built with members of the community, about the current issues facing the city, and about what he’d do as mayor to improve those issues — all with the lumbering gusto of a circus elephant performing a trick for the 3,784th time. The man is clearly in campaign mode, but who could blame him? He’s running for mayor against an incumbent with $10 million in his war chest and friends with deep pockets. He’s given a ton of interviews during the last four weeks, with two tons more expected in the coming weeks. It’s before eight o’clock on a grey Friday morning in December, and here he is speaking to the most underrated writer from the most underrated magazine in the most underrated city. I can hardly bear promoting myself to someone, much less having to do it over and over again — and first thing in the morning, too. 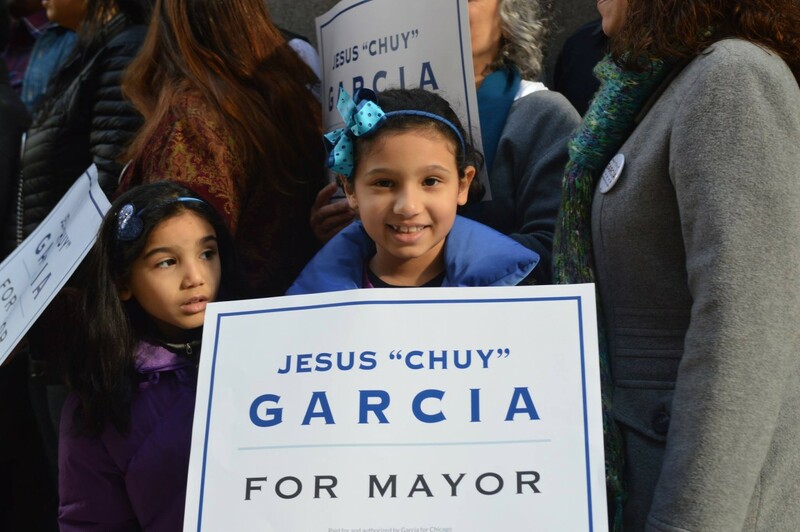 Compared to the current mayor and his predecessor, who already carried hefty names by the time they decided to run for mayor of Chicago, most Chicagoans had probably never heard of García before he threw his name into the 2015 mayoral race. Voters of my generation are too young to remember his early glory during the Eighties and Nineties, before he was forced out of office by Chicago’s notorious Democratic machine nearly 17 years ago. Any mention of García’s position on the Cook County Board of Commissioners is unlikely to earn him an avalanche of approving nods — something he readily admits to during our conversation: “The county board doesn’t get much attention,” he titters. It’s just the kind of governing body whose work gets routinely overshadowed and forgotten in city like Chicago, despite the fact that it’s in charge of a range of policies for the second largest county in the United States. Any lack of name recognition García suffers is no fault of his. García’s fingerprints on city politics date back at least 30 years, having been a major actor in the shaping of what it means to be an independent progressive in Chicago’s post-Washington era. What’s more, not only has García been an agent of change in post-Washington Chicago, he was also part of the multiracial, citywide coalition that helped Washington win City Hall in 1983. It was during the election that García worked as campaign manager for Rudy Lozano, who was hoping to be alderman of the 22nd ward and become the first Mexican American elected to the City Council. García and Lozano had helped found the 22nd Ward Independent Precinct Organization, which formed alliances with the West Side’s black community to support black and Latino candidates in the 1982 state elections. In 1983 Lozano ran against machine-backed incumbent Frank Stemberk; Harold Washington, a U.S. congressman at the time, faced the incumbent Mayor Jane Byrne and a young state’s attorney by the name of Richard M. Daley in the Democratic primary. Though they’d lose to Stemberk by just 17 votes, the Lozano campaign encouraged Latinos across the city to vote for Washington, who beat Byrne and Daley, and then went on to defeat a Republican opponent backed by the Democratic establishment in the general election. Washington took his seat as mayor of Chicago in April 1983. In June, Lozano was shot dead in his kitchen by a gang member. Daley, the state’s attorney who had just run (and lost) against Washington, never provided a motive for Lozano’s killing, leading many to believe it may have been retaliation for Lozano’s activism and politics. Their promising young leader dead and buried, the 22nd Ward IPO tapped García as their new captain. Most of his mainstream biographies place the genesis of Chuy García’s political career here, as Lozano’s campaign manager and subsequent successor. Yet that a man born in the Mexican state of Durango in 1956, and whose family came to Chicago when he was 10 years old, would see his political life begin as campaign manager for a superstar like Rudy Lozano seems much too overnight celebrity to me. After all, García was only 27 when Lozano was murdered. Surely he’d been politically active before that. “We formed a student group at my high school, St. Rita,” García says when I ask him how he got into politics. “It was to help students with their studies — me in math.” García’s voice perks up as he shares more about the organization, as if reliving the feisty zeal of his youth. Though its founders were Latino, the group welcomed all of their fellow classmates at St. Rita, regardless of race or ethnic background. Later García would be part of a campaign against the numerous health and safety violations at a local theater in Little Village, demonstrating early on the community-based approach that would define his political career. When I press him for a concrete plan to ensure senseless deaths like Michael Brown’s in Ferguson and Eric Garner’s in Staten Island don’t happen here in Chicago, García points to a surprising exemplar: former Mayor Richard M. Daley. “The concept of community policing was there, but it didn’t go far enough, it didn’t go deep enough,” he says. The “it” is the Chicago Alternative Policing Strategy — known as CAPS — Daley’s signature community policing program. Launched in 1994, CAPS sought to bring together police officers, community members and city officials to proactively address public safety issues instead of merely reacting to them. But instead of fulfilling its mission, García explains, “it fizzled.” He acknowledges that the program showed promising results in some neighborhoods; in others, however, CAPS became a forum for old folks to complain about minor nuisances. Today, CAPS lies dormant, awaiting fresh ideas and renewed commitment. One such idea is the theory of restorative justice García advocates. It focuses on healing both the personal and communal damage inflicted by criminal acts, calling together all parties — victims, offenders and members of the community — to agree on proper resolution, which may or may not involve restitution, community service, or even a simple apology. Admittedly, the theory sounds like a load of hippy-dippy nonsense; still, given the failure of our current criminal justice system to tackle crime effectively and humanely, restorative justice may offer a better alternative. The residents of Little Village, Back of the Yards and North Lawndale seem to think so: they already have restorative justice centers up and running. The redrawing of ward boundaries following the 1980 census had carved up black and Latino communities, ensuring a white, pro-establishment majority in the City Council. While whites, blacks and Latinos made up 40 percent, another 40 percent, and 15 percent of the city’s population, respectively, 33 white men sat on the City Council, but only 16 blacks and one Latino. (The one Latino was Miguel Santiago of the 31st ward, who sided against Mayor Washington.) Washington’s team sued the city in federal court for what it claimed was racist gerrymandering. In December 1985 a federal judge agreed, ordering seven wards be redrawn to better reflect the racial and ethnic diversity of the city. Special elections in those wards were scheduled for March 18. One of the seven wards was the 22nd, where García was committeeman. He decided (or was pushed) to run. Curiously, incumbent Alderman Stemberk chose not to contest his council seat after his ward was redrawn to represent its large Latino population. (Stemberk was also catching hell after he let slip that, though his mother and he were registered to vote at a place on West 31st Street, his wife and kids lived in a Riverside home.) Instead García main opponent was Guadalupe Martinez, a supermarket owner and pawn of the Democratic establishment, and during the campaign she accused García of being “100 percent communist.” García won 55 percent of the vote, and he became alderman of the 22nd ward just a few weeks shy of his 30th birthday. 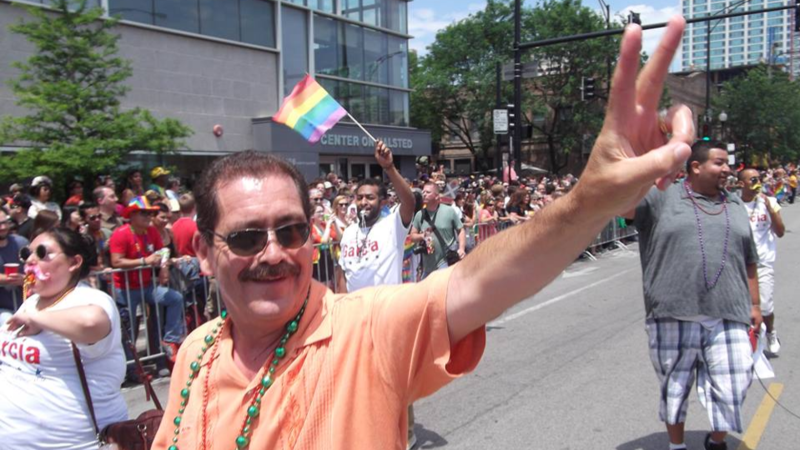 Only a few months in office, García backed a move to pass Chicago’s first human rights ordinance, which would’ve banned discrimination in areas such as housing, employment and education on the basis of race, sexual orientation, religion, age and other groupings. His position on the issue was especially precarious in a ward like García’s, which was predominantly Catholic. When the archbishop of Chicago, Cardinal Joseph Bernardin, came out strongly against the measure, García reluctantly withdrew his earlier promise to vote for the bill, though he later offered to join gay rights groups in putting pressure on the church leader. García eventually voted for the ordinance when it passed two years later, and he remained a firm voice for equal rights long after giving up his council seat in 1993 to become the first Mexican American to the join the Illinois Senate. During his two terms as a state legislator, García also carried on the fight for education reform he’d begun on the City Council. As he tells me over the phone, García’s work as 22nd ward alderman led to the building of more schools in Little Village to address overcrowding. He voted for Governor Jim Edgar’s bill to provide Chicago schools with $130 million in additional funds, as well as legislation to increase funding for daycare and after-school programs. I ask him if, as mayor, he plans to reopen any one of the 50 schools Mayor Emanuel closed in 2013. “I have a long history of being an education advocate that goes back a long time,” he insists. “It includes my vote against, uh” — he laughs — “the so-called ‘reform bill’ that gave us the unelected school board … That started the whole chartermania that’s occurred in Chicago: creating charters just for the sake of having another tier of schools in Chicago that hasn’t really enhanced public education.” After leaving Springfield, he would head a community organization that pressured Chicago Public Schools to build a new campus for Little Village Lawndale High School. Finding himself out of elected office for the first time in 15 years, García stayed committed to public service, becoming the first executive director of the Little Village Community Development Corporation — now known as Enlace Chicago — which advocates a grassroots approach to community development. He also served as founding president of the Latino Policy Forum and as a fellow at DePaul University, as well as teaching political science and Latino studies at the University of Illinois at Chicago. In 2010 he was named board chair of the Woods Fund of Chicago, an organization championing Chicago’s working-class community — and whose past board chairs include a Mr. Obama and a Mr. Ayers. The day before our interview, I read an article published by In These Times whose headlined asked: “Is Gentrification Inevitable?” I thought it as good a question as any to pose to someone running for mayor of Chicago, so I ask García what he thinks. “I think if we make Chicago’s neighborhoods more livable,” he begins, “healthier, more diverse — you know, to break with the patterns of segregation that have existed in Chicago — we will have neighborhoods, good neighborhoods, all over the city. I think that’s what’s key in terms of having housing opportunities all over the city. Unless you do that — and that requires putting neighborhoods first, especially ‘cause they haven’t been first for some time, in terms of the city’s priorities — you’ll have this phenomenon of gentrification.” Here again, García’s all about a “priorities at the top, participation at the bottom” approach to solving the city’s problems. Truthfully, my question was meant to be provocative. García’s whole career — his work on the City Council, his time in the state senate, and especially his work as a private citizen and most recently as Cook County commissioner — proves he’s a champion of fairer housing opportunities for historically neglected sections of the city. In 2013 the commissioner spearheaded the passage of an ordinance amendment that protected people with choice vouchers — commonly known as “Section 8” — from housing discrimination. At the time García called it “a great day in the history of Cook County Government,” saying that “after many years and a long battle we have done away with one of the legal methods of discrimination in our county. It means that people down on their luck, trying to provide the best for their families, can have the same access to safe, decent, affordable housing as anyone else. We are talking about veterans, the disabled, single-parent heads of households, senior citizens.” Returning to the issue of gentrification, García discusses the “need to reduce displacement” by working with community members to revitalize the commercial strips in their neighborhoods. 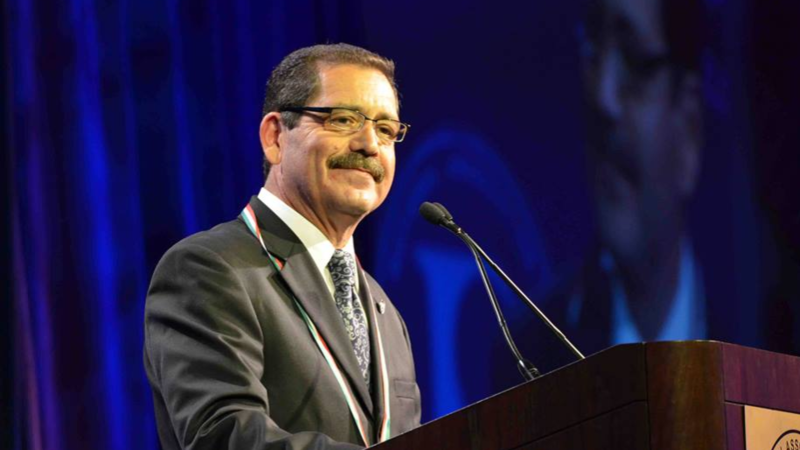 García made his triumphant return to public office in 2010 by defeating yet another machine-backed incumbent in yet another primary to become Cook County commissioner. (This time his opponent was Joseph Moreno, who is currently serving 11 years in federal prison for bribery.) Though he’s quick to tell you how his role on the county board is generally low-key, the policies he and the board have enacted over the past four years have improved the lives of countless local residents. In 2013 García was awarded the Premio Ohtli by the Mexican government, its highest honor recognizing the work of men and women who serve the global Mexican community. García assures me he’s talked with people from all walks of life in every corner of the city and they all tell him the same thing: Rahm doesn’t have the votes to win outright like he did in 2011. Chicago elections aren’t your average winner-takes-all, wherein the person with the most votes wins. Instead, should Mayor Emanuel fail to receive more than 50 percent of the vote, then he’ll face the runner-up in a runoff election on April 7. “That means a vote for any candidate other than Mayor Rahm is essentially a vote for a runoff,” writes the always dead-on Ben Joravsky over at the Reader. Last I saw, eight aspiring men are taking on Rahm in 2015, which should be enough to keep Rahm under 50 percent in the first round. (A 31-year-old West Side wunderkind had been running all year, but she dropped out to endorse another candidate.) 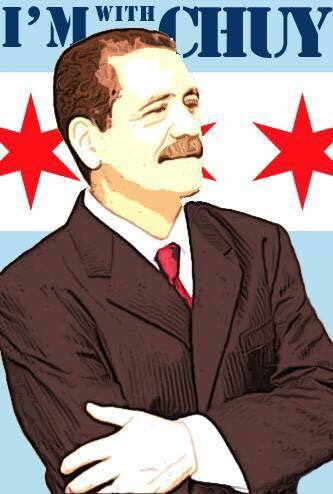 At the moment it looks like García will be the guy to face Rahm in a runoff election. He’s already been endorsed by Karen Lewis and Cook County Clerk (and mayor for a week in 1987) David Orr, with plenty more surely headed his way. And in a head-to-head with such an unpopular mayor, an independent progressive with a long career in city politics just might breeze into City Hall, no matter how many millions the incumbent tries to bury him under. There’s plenty more I’d like to discuss with him: I want him to talk about his boyhood in Mexico and about the recent events there; I want to ask him about bringing together the Puerto Rican neighborhoods of the North Side and the Mexican neighborhoods of the South Side, and about building a wider, multiracial coalition in general, like the one he was a part of back in the Eighties; and I’d like to know how he plans to overcome the level of voter apathy — specifically among young people and Latinos — that resulted in crushing defeats for the Democrats during the recent midterm elections. But unfortunately my half-hour with the man is up. The man has other interviews, other people to pitch to. He’s the next mayor of Chicago, after all. Before I thank him for speaking with me, I ask him one last question: is Chicago ready for its first Latino mayor?